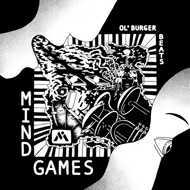 With these words in mind from lyricist Ivan Ave, we present to you Ol’ Burger Beats’ sophomore LP Mind Games. The first LP on the newly founded label Mutual Intentions, and one of the most thematic releases we’ve done to this day. Ol’ Burger is known in the beatmaking circles for his jazzy sound and great drums. With his latest ”Unreleased Instrumentals EP” well received, it’s now time to let the rappers jump on his beats. The feature-list includes underground heavy hitters like Chester Watson, Jeremiah Jae, Quelle Chris, Ivan Ave, Fly Anakin & Koncept Jack$on and KAMI from SAVEMONEY.